Love To Eat Right: Healthy Breakfast: Does watching my weight make me a weight watcher?? 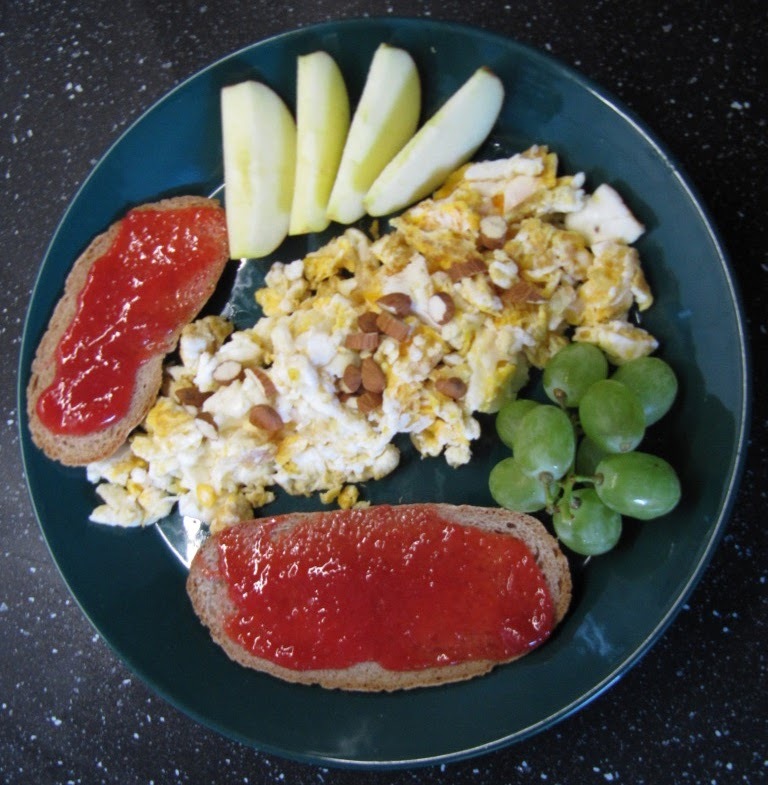 Healthy Breakfast: Does watching my weight make me a weight watcher?? Weight watching, well in simple terms that means for me that I get on the scale every morning. The numbers usually fluctuate around the same value. Most recently it has been going down some, since spring and a huge effort for more steady training and a better diet are taking their effects. Not only for controlling your weight, but also making sure you are well hydrated can be a benefit of measuring your weight. Today is a big training day for me, but since the weather in Europe went through a huge drop in the temps, I am doing my long brick later in the day. Hence a healthy breakfast was in order. Prepare the eggs as per your liking. The reason for not eating 3 whole eggs and instead eating 2 was that the egg yolk contains more fat then the egg white and the additional egg whites add some extra protein. I chopped up the almonds and put them on my eggs, you can simply eat them on the side as well. Almonds are a ph-lowering food, which also contain monounsaturated fats, the good kind. My homemade strawberry rhubarb jam is simply amazing; it tastes fantastic and is so easy to make.